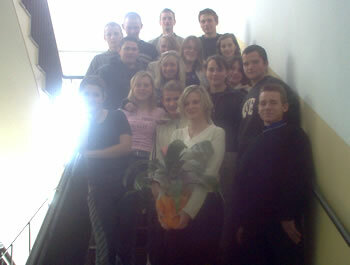 In the spring of 2005, ten students from Przerosl High School divided into three teams to write essays about the Jews who used to live in their town. The essay project was ably and enthusiastically supervised by their English teacher, Monika Leszczynska. On June 21, 2005, the students presented their essays at a ceremony that was attended by the Mayor of Przerosl, the head of the Suwalki District Council, and other local dignitaries. In recognition of their achievement, all of the student participants were awarded portable CD players, which were purchased entirely from funds that were donated through this website. Not only are the essays easy to understand (they required only some light editing), they are quite moving, and they contain historical information that might have been lost were it not for the efforts of these remarkable students. To read the essays, select the links below.